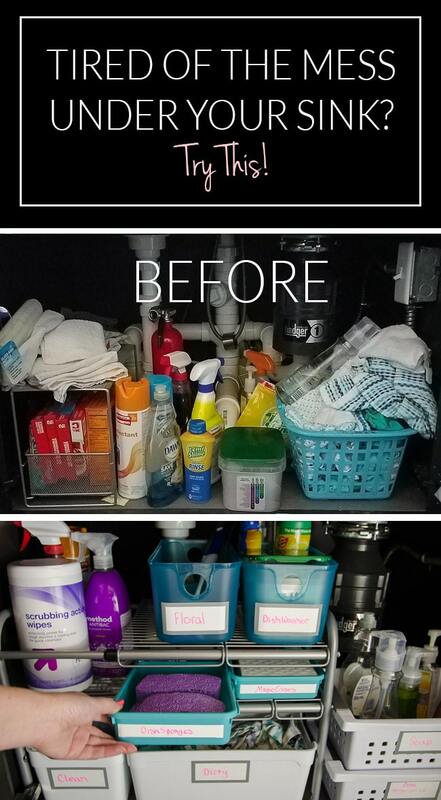 This new under sink organizer could have been a hit or flop, but I was willing to try anything to add more storage under the kitchen sink! 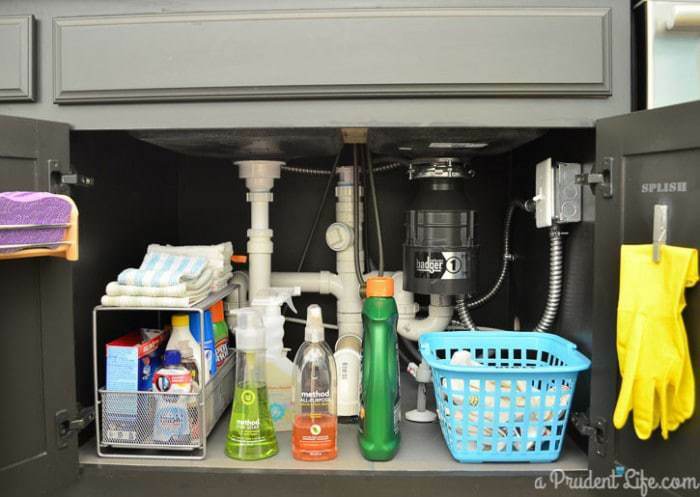 The cabinet under our kitchen sink was one of my first organizing projects on the blog a couple years ago. Many of the ideas were still working, but as with most projects, over time I thought of a few ways we could make it even better. 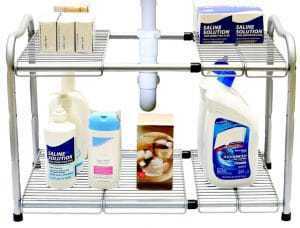 It wasn’t a huge priority until I spotted a flexible under sink organizer designed to work around MOST plumbing. I say MOST because I had blocked out how ridiculous the plumbing is under our kitchen sink. Because the sink is in the island, all the plumbing goes down into the floor instead of out back of the cabinet. The garbage disposal and plumbing to the dishwasher make things even more fun. All that to say, even with NOTHING extra under the sink, it’s a mess. For comparison, here’s what the nice plumbing on the organizer box looks like. And here’s the reality at our house. Quick side note in case anyone is considering a black island: It’s extra hard to keep clean and you get a dark cave-like atmosphere under the sink. If anything falls toward the back, you can bet we won’t find it for months. Our white cabinetry is somewhere between a billion and trillion times easier to keep clean than the black. Okay, back on topic now…. Here’s what this cabinet looked like the first time I pulled everything out and improved it a few years ago. There were a couple of new problems I needed to solve. First, the cleaning cloths on the left needed to be contained. The stack grew over time and liked to fall off the shelf into no man’s land in the back. The dirty cloth basket on the right is my absolute favorite and most functional innovation from the old system. I hated putting the kitchen towels in the normal hamper with our clothes, so they always lingered around the kitchen or laundry room. Adding a little basket for them was perfect! Well…almost perfect. Turns out that basket could hold an impressive number of towels. 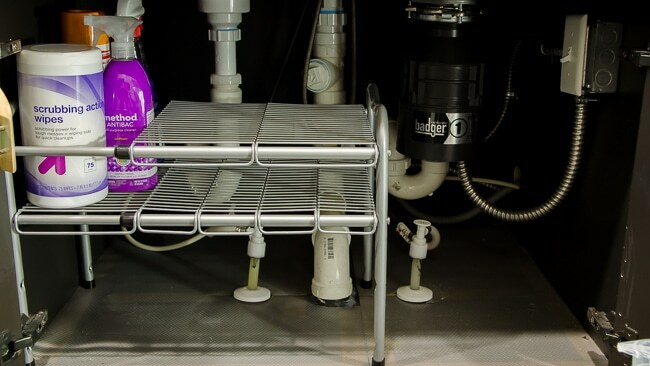 Here’s the scary truth of what things were looking like the day I set out to improve our under sink system. It wasn’t always that bad, but I thought I’d be real and show the worse case scenario of what it looks like before laundry day. My plan A was to add the new shelving to the right of the existing silver drawer/shelf combo. That didn’t work at all between the garbage disposal and metal cord running to the garbage disposal switch. It turned into a Mensa-level puzzle to come up with a configuration that maximized storage. The only place the new organizer would fit was flushed to the left side. The back leg fits between two pipes, and I had to adjust the bottom shelf to the highest position to float over the pipes that go into the floor. This was the point that I really began to appreciate the flexibility of the organizer. The adjustable height shelf saved me AND each piece of the shelves being separate meant I could leave the top partially open in order to accommodate the height of the kitchen cleaning supplies. Because the sink drops so low, none of the bottles would fit on the top shelf. I love this set up because there is a rail across the back that keeps the bottles from falling. The only downside to the organizer is that the shelves shown in my photos are the only ones that come with the system. 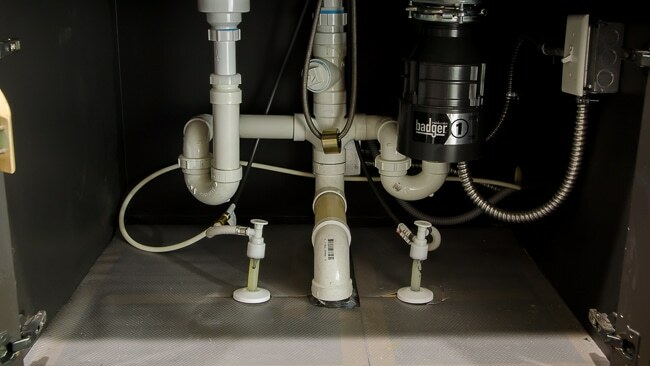 It worked perfectly for me, and would be fine if you needed a gap to go around plumbing, but I wanted to point that out so you wouldn’t expect extra shelves. For the short space between the shelves, I picked up a pack of drawer organizers. The largest size was perfect to hold things like Magic Erasers and sponges. Amazon sells the same set I used in white and black, or I found the teal color in store at WalMart. The turquoise bins on the top shelf are from Target and come in a few different colors on their website. 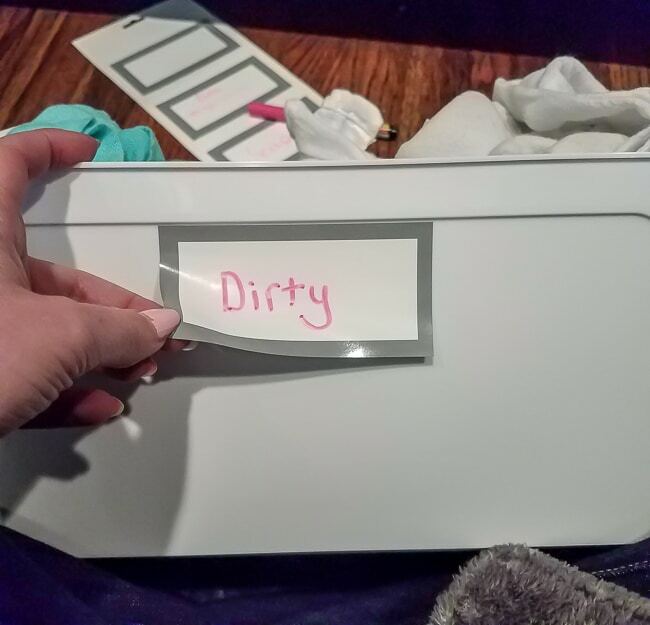 To label all the bins, I used dry erase labels from Target (in store only). After I used the labels, I cut off the excess to use on my short bins. The whole sheet is sticky and dry erase material, so why not use it all? I keep a pair of pruning shears under the sink for flower arranging, but they never had the perfect home. I’m excited I’ll always be able to find them going forward. 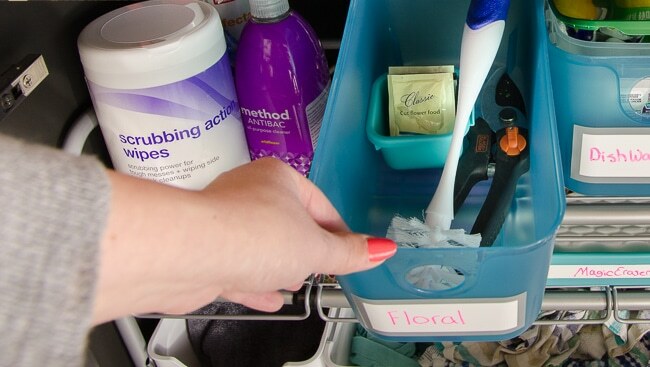 There was plenty of room in the floral bin to add one of the small containers from the drawer organizing set I mentioned above. It’s perfect for extra plant food. I also threw in the long scrubber that I use to clean out vases. With the bottom shelf of the organizer so high, I had space to add bins below it. This was the perfect spot for the clean and dirty cleaning towel bins. The white bins also came from Target in store. 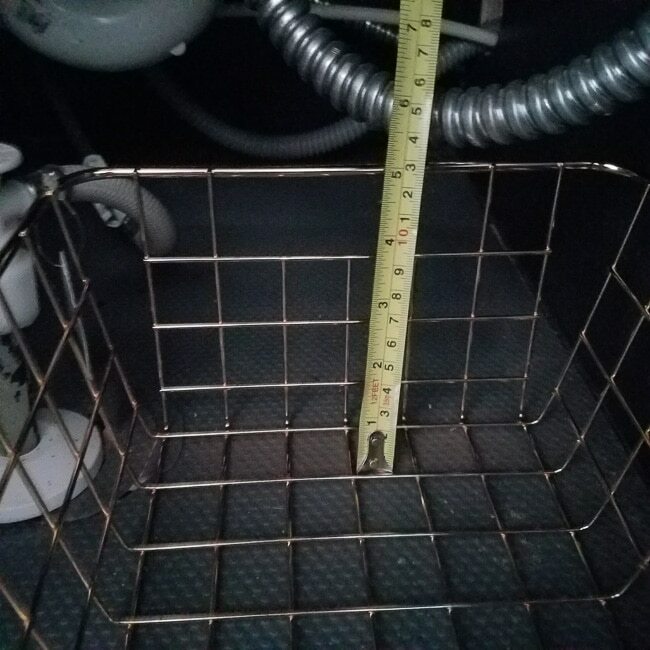 Now the clean towels won’t fall into the death trap of darkness at the back of the cabinet, and I physically can’t overload the dirty bin too much because there is a shelf above it. Sometimes limited space is just what we need to stop a bad habit! The right side of the cabinet was the biggest challenge. 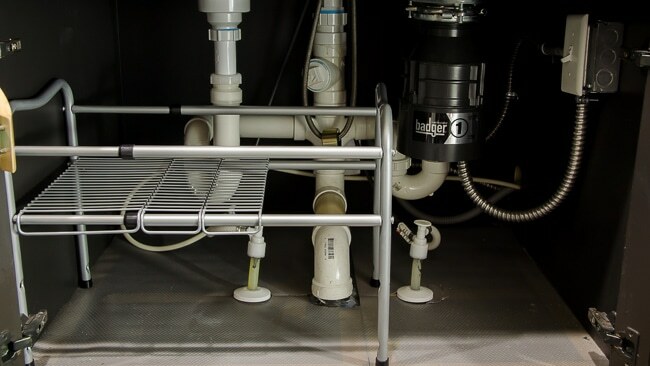 The garbage disposal and all its necessities meant space was very restricted. I was determined to maximize the space, so I took some measurements and headed back to WalMart to see if I could find a solution. I ended up finding a product that I know I’ll use again and again. 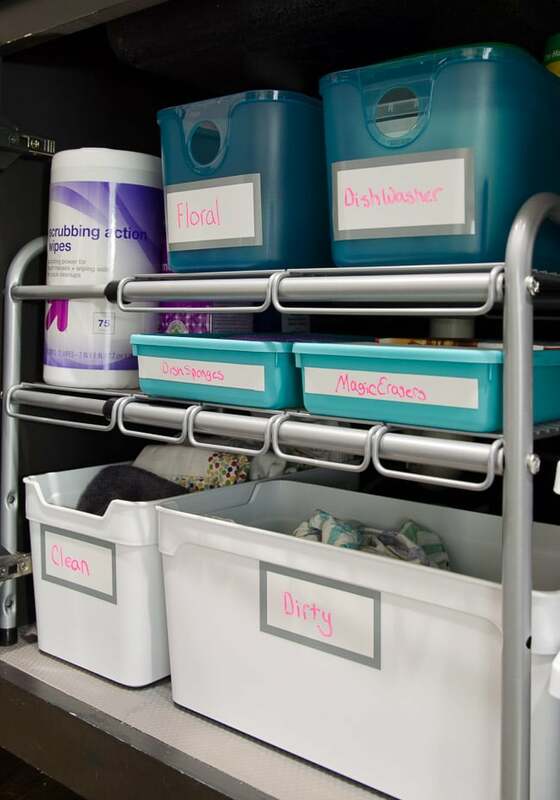 The white stackable bins below come in three sizes and are totally affordable! Amazon sells them by the 6-pack here. I’m using the top bin for dish soap and extra hand soap. Having the dish soap 6 inches higher is a really small change, yet it makes it so much easier to grab and put away. The bottom bin is perfect for miscellaneous items like extra gloves and sponges. We’ll only need them occasionally, so it’s no problem that they are hidden. 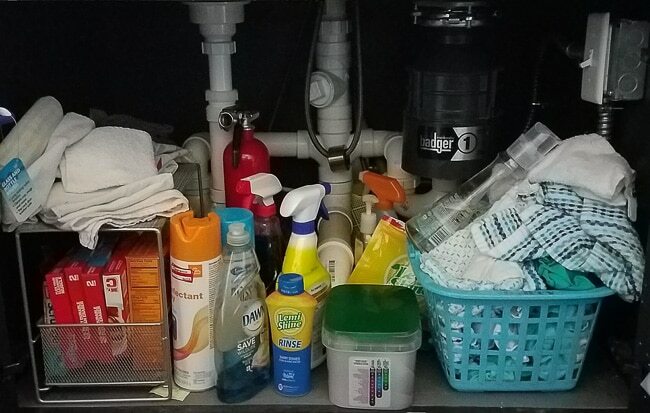 Overall, I’m really happy with how the new under sink organizer worked out. I’d definitely use it again! Next up, here’s how to organize the rest of the kitchen! Here’s one more look at the before and after. Ha! You’re the best Sara, I’d love to! But I know you could pull this one off on your own too. I had no idea there were such flexible options for under my kitchen sink. You’ve inspired me to get out the measuring tape. Thanks! So glad it inspired you, Bethany. You’ll love how much more functional you can make it with just a few products! So weird that such simple things can make one happy – they certainly do me! Just a reminder to always measure your spaces, I winged it today whilst out shopping and will have to return my next tiered shelf racks tomorrow! ? Oh man, that is the truth! I’ve learned that measuring lesson so many times! And I agree that the simpliest things can completely impact our happiness. It’s so interesting that your mood can be affected either positively or negatively every time you open the cabinet under your sink! Aha! What an improvement. Why does it seems so great to me? – because I don’t like what I have so you have inspired me to try, try again and see if I can’t make this a better space. I’ve just redone my bath and am ready to tackle spots in the kitchen and under the sink always needs a better solution! I really like the dry erase labels – can be changed if necessary. The bins look good and by doing a label you are more apt to find what you are looking for. I like the idea of the clean and dirty towels/cloths! What a blessing to have them at your fingertips and then when washing time comes you can just dump the whole bin into the washer. Such a splendid idea! Always a lot of bottles to deal with. Mine are too close to the top of the cabinet so they are hard to see – maybe I can use your idea of stacking two bins. I also like the idea of putting everything for the dishwasher together, etc and using a label so you can easily find what you are looking for! Great and thanks so much for your inspiration. I loved that about the dry erase labels too! I was just chatting with a friend about them, and I’m thinking of looking for some wet erase markers to test with them. So they’d never rub off accidentally, but you could remove the words easily with a damp rag. 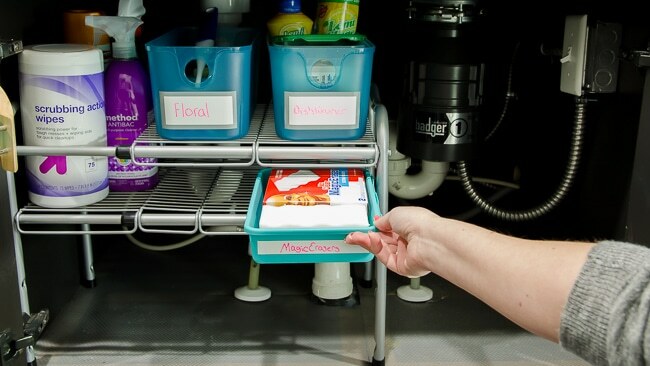 You will LOVE the dirty towel bin if you throw one under your kitchen sink, it’s such a small thing, but make a huge difference in our workflow. The dishwasher bin may end up being my new favorite idea. Since the jet-dry type stuff only gets used every few weeks, it always seems to disappear! I’m so glad the post insipired you. I’m getting ready to post about cleaning out our dresser, so hopefully that will be helpful too. I’m inspired and ready to spring clean!! What brand labels from target are using? Do you use the alcohol wipes for kitchen cleaning…counter tops etc? I’m pretty sure the labels are the Room Essentials brand. They were in the section that has the “prettier” organizing bins. Not the Rubbermaid aisle, but the Room Essentials, Threshold, etc near the home decor. And yep, the wipes are what I use every night on the countertops and glass stove top after we cook. They’re just the Target brand of the Lysol/Clorox scrubby wipes. Somewhere a granite company may be upset I don’t use special cleaner but for our slab, I’ve always used the wipes with no issue. I’d test them in a small area before wiping them all over a surface, though. 🙂 At some point, I’ll probably switch back to using a more natural spray and cloth towels, but we hit a busy season of life and simple won out! 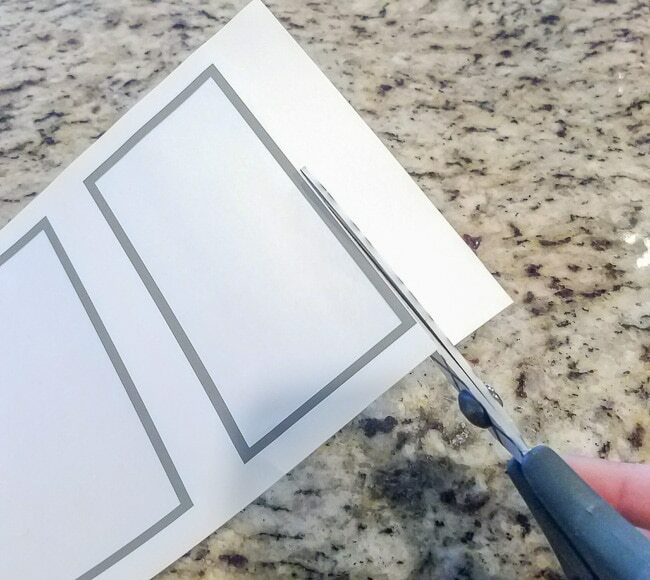 Still on the hunt for these dry erase removable labels!! Haha!! Any other suggestions for similar labels? I’ve gone and called several Target stores and can’t seem to find these anywhere? And I really like the silver border that yours have. I know you said their in store only, but they have no clue what I’m talking about. 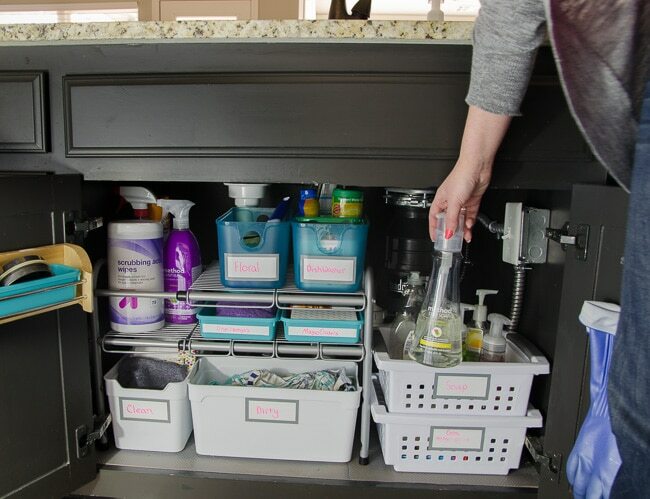 You’re going to love having that cabinet under the sink organized!